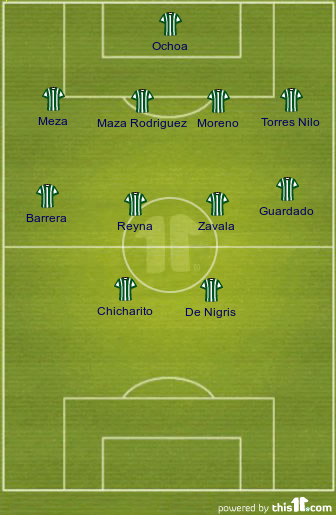 Mexico vs USA: A Personal Perspective and Preview to August 15th. I was raised as a Catholic, but my true religion was that of the tricolor. I was born in East Los Angeles but my father made sure that my true soccer allegiance was tied to that of the Mexican national team, he made sure of it. After playing a few years with “Los Tapatios,” a second division team associated with Chivas of Guadalajara in Mexico, my father had to move north to the United States in order to find work. He eventually settled down to become a mechanic, met my mother, and continued to work as his dreams of soccer glory began to slowly slip away. While his peers (such as the current coach of the Mexican national team, Chepo de la Torre) continued to have much success, he continued working in the U.S. and supporting his national team back home. After I came around, I was taught everything there was to know about Mexican soccer. He explained to me the stunning size and beauty of Estadio Azteca, the wonderful playing style that Hugo Sanchez once had, and about the very infamous rivalry with the United States. For a Mexican soccer fan as myself, watching the team play in the 90’s felt like being on an emotional roller-coaster. It was exciting to see them do well in multiple international tournaments but also disheartening to see them begin to lose friendlies to the U.S. at the same time. Although I rooted for the U.S. in every other sport and was proud (and still am) to be born in the United States, I couldn’t support them in soccer, it went against everything I was taught. It became embedded in my mind that Mexico was my team and a loss against their main rivals would be devastating for me. Before the 90’s, Mexico had played their rivals 27 times and gained an impressive 22-3-2 (W-T-L) record. Other than the 2-1 upset in 1980, their only other blunder was during their first meeting in 1934. During the 90’s, Mexico achieved a 5-4-5 record against their northern rivals. Not a terrible record but also not satisfying either as I saw my once immaculate heroes making mistakes. Ramon Ramirez began to make bad passes, Claudio Suarez somehow let forwards pass by him and Jorge Campos wasn’t able to block every shot. My perfect world where the U.S. was always inferior was beginning to end. As the 2000’s rolled around, things did not get any better for Mexico. Qualifying for the 2002 World Cup, a usually easy task, became difficult as the team suffered multiple losses, including one to their rivals. Just one year later the teams once again squared off in the round of 16 of the Korea/Japan tournament. Both teams had seen each other in the past but this was the first time at the World Cup and through a knockout game as well. The stage couldn’t get any bigger for each country. To say I was nervous, would be an understatement. 90 minutes later Mexico had lost 2-0, an obvious upset to the team and a blow to the confidence of the supporters back at home. It took almost 8 years for Mexico to finally beat the U.S. and reclaim their soccer dignity. Before the Gold Cup final in 2011, I would have probably told you that the U.S. national team was better than the Mexican side. Since then, I really haven’t been able to say who is better, my obvious bias wants me to say Mexico, but I can’t help but recognize the talent of the U.S. team as well. While it is tough to admit (and I’m sure it’s tough for U.S. fans as well), I think that both teams have learned to benefit from each other. The CONCACAF has gained much more respect as both teams have continued to flourish in international competitions. Through that we have been able to gain more spots into the greatest stage in soccer, the World Cup. in 1990 only 2 teams from the CONCACAF were allowed to qualify, now going into the 2014 Cup, we have 3.5 spots allotted for North America. The movement of players between the countries is also over-looked. Players such as Joe Corona and Herculez Gomez are able to train and compete in Mexico while playing for the U.S. national team. Rafa Marquez, one of Mexico’s most famous players, competes in the MLS as a member of the New York Red Bulls. Chivas USA was brought into the MLS in order to cater to the Mexican fans living in Southern California while there are talks of creating an MLS team from Mexico. It is sometimes all to easy to look at the animosity between both sides (such as the fan conduct during the 2011 Gold Cup Final) and completely forget the progress that has been made. That being said, I have learned to like and respect the U.S. national team, it’s obvious that they are becoming better each year and may even win the World Cup at some point in the future, but until then, I still have to support and love El Tri. Although most of these players aren’t associated with the most recent gold-winning Olympic squad, they are no doubt going to have high expectations going into this game. Veterans such as: Salcido, Marquez, and Dos Santos will all more than likely miss out in the game. The absence of these players may prove to be detrimental to the team, especially for the middle of the field. Up top, Chicharito is looking to get back in form. With only two goals this year for Mexico and little starting time at Manchester, the little pea has not reached the level of confidence that he once had a couple of years back. Will this be his time to shine? The midfield is key here for the U.S. team. The sight of Bradley, Donovan, and Dempsey all together would make any national team afraid. Then again, Dempsey has had much to deal with outside of the field with his current club back in England. Is this the time to play for Clint? The back four still looks a little shaky as well as there are still many people questioning over who should start. Should Ream be given a chance? Goodson? Lichaj? Either way, the U.S. is going to have plenty of options and will need to play their best game if they want to win in Azteca. -Mexico leads overall with a 32-12-15 (W-T-L) record. -Since 2005 the record has been 4-2-4. -Their last meeting on August 10th, 2011 was a 1-1 tie on U.S. ground. -This will mark the 60th game against each other. -On neutral territory, the record is 2-2. -The last U.S. vs Mexico friendly in Mexico was played in 1984, which lead to a 2-0 victory for Mexico. -Their first meeting in 1934 required a month-long boat trip for both teams to Italy. The confident Mexico side rested the whole month while the U.S. trained on-board. An unprepared Mexico lost 4-2. -Three players have played on both teams: Martin Vasquez, Edgar Castillo, and Joe Corona. If anybody can show me a site where I can get a 1998 Mexico home jersey, you will be my best friend. I think your best bet for the 1998 jersey is eBay or Mercado Libre (http://www.mercadolibre.com.mx). Just keep checking every few days, and make sure it’s the real deal and not some knockoff. I have several, but they’re signed and framed. Suerte!